A new report supported by world-leading institutions has found that global emissions could be reduced by up to 25% by using already-established climate solutions that do not need to be supported by new inventions or vast amounts of capital. The report from European think-tank Sitra - which is backed by the European Climate Foundation, the World Bank Group and the World Resources Institute (WRI) among eight other organisations - suggests that using 17 proven climate solutions from across the globe, 12 gigatonnes of greenhouse gas emissions could be cut by 2030. Mikko Kosonen, president of Sitra, said: “We already have climate solutions that are proven to work at the level of nations. How far can we go if we take these to a global scale? "The Sitra report shows that these off-the-shelf solutions can make a big contribution to closing the emissions gap, without breaking the bank, and with no need for out-of-this-world inventions." The potential 25% reduction is more than three times more than the current pledged reductions from governments committing to the approaching COP21 climate talks. It is also equivalent to the combined annual greenhouse gas emissions of the USA and European Union. The 17 solutions in the report fall under five categories: renewable energy, industry, transport, buildings and households, and forests and agriculture. The report found that grid-connected solar – used predominantly in Germany – could reduce more than 4,500 megatonnes of CO2e by 2030. Other efficient methods include reduced deforestation (4,000 megatonnes), wind power (1,200 megatonnes) and improved cook stoves (1,500 megatonnes). The report did note that internationally scaling up the most effective solutions would also prove the most expensive for consumers and taxpayers. To combat this, the report suggests offsetting costs through efficiency measures that deliver reduced energy bills. 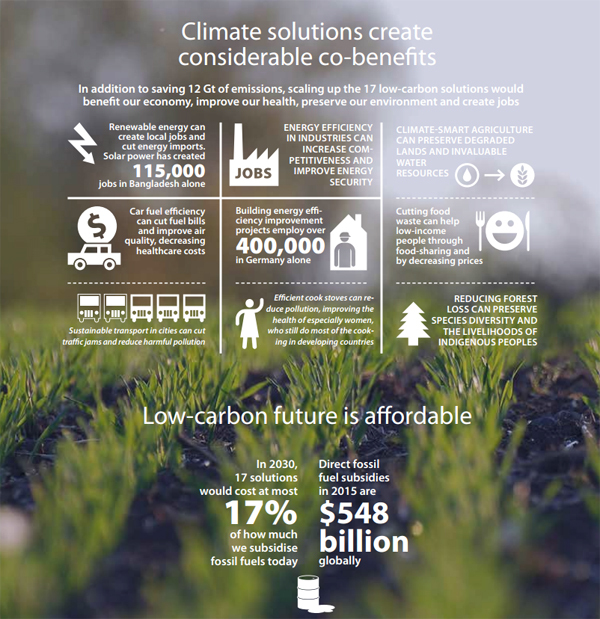 All 17 solutions would create an annual deployment cost of $94bn by 2030, but this comes with net savings of $171bn. Andrew Steer, president and chief executive of the WRI, said: “The Sitra report presents smart, common sense actions that countries can take to close the “emissions gap” while promoting strong economic growth. Sitra and its partners will brief government officials on the results of the report in Washington, D.C. followed by Rio de Janeiro on November 25. Sitra believes that the findings could go a long way to bridging the emissions gap as global governments attempt to limit global warming to less than 2°C.